In 2016, Samsung wants you to make one of its new Smart TVs the center of your smart home (assuming your home is smart, that is). The company has announced that each of its upcoming models will be able to connect to other Samsung devices and serve as SmartThings hubs, allowing them to connect to all SmartThing-compatible devices. Samsung owns SmartThings, a company whose Hub lets you control hundreds of smart things around your home from a smartphone. The 2nd generation Hub launched earlier this year with the ability to control ZigBee, Z-Wave, and LAN-connected devices without an Internet connection. By sticking this functionality into a TV, Samsung hopes to reach people who may be put off by the idea of managing things through yet another app. Couch potatoes in particular may be more likely to notice motion sensor alerts as they pop up on the screen already in front of them. Folks who find all of this stuff a bit gimmicky may still appreciate the ability to dim lights automatically and adjust sound whenever a movie starts. Samsung says a SmartThings Extend USB adapter will be required to connect to SmartThings-compatible products. Expect a better look as CES kicks off next week. 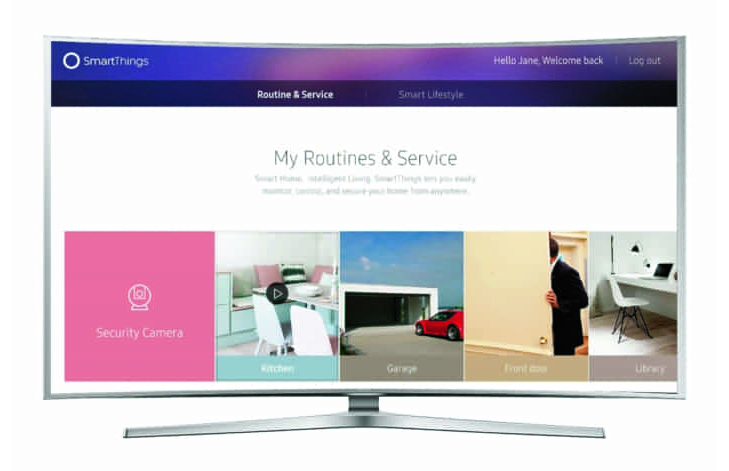 Samsung Electronics announced that its entire 2016 Smart TV line-up will be Internet of Things (IoT) ready and connected with the SmartThings platform. SmartThings is an open platform that allows users to connect, manage and control smart devices and IoT services. “The 2016 line-up of Smart TVs will offer consumers new possibilities and cement Samsung’s market leading position, as the first company to launch IoT ready TVs.” said Hyun Suk Kim, President of Visual Display Business at Samsung Electronics. 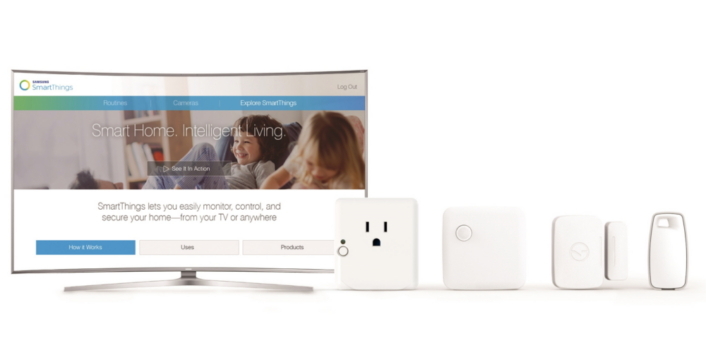 SmartThings allows consumers to access all of their smart devices directly from their smartphone and SUHD TV, rather than having to control individual devices with a multitude of separate apps. With the SmartThings application, people can easily connect and manage all of their smart home devices and services through a single, simple user interface. With an outdoor camera connected to their Samsung Smart TV, customers can check when visitors arrive and choose to open their front door, directly from their sofa. Motion sensor alerts can also pop-up directly on the TV screen, if movement outside the home is picked up, providing more security and peace of mind, whether at home or away. The SmartThings application’s Cinema Mood also makes it easier than ever to create the perfect home theater environment. It enables consumers to automatically adjust everything from ambient lighting to surround sound, so they can instantly provide the optimal movie viewing experience. While each 2016 SUHD TV will be enabled with this SmartThings technology, the functionality will be activated regionally as SmartThings expands its platform availability. To find out more about SmartThings uses and compatible devices, please visit www.smartthings.com.